Nemerson was President of from 2009 to 2011 and for which he is still board Treasurer, schedule a conference in Washington D.C. where Tech Councils meet to review key federal issues and then meet with their delegation on the "Hill." Last week 60 Councils and technology members met along with staff from a national IT association CompTIA (creators of the A+ certification program). Nemerson and Natalie Carpenter, a lawyer and lobbyist for South Windsor’s TicketNetwork (a past top winner in the CTC’s Marcom Tech Top 40) represented Connecticut during the conference. Matthew and Natalie visited all of the state’s Congressional offices and actually met with Reps. Rosa DeLauro (CT-3) and John Larson (CT-1). They also met with Hill staff handling technology, immigration and workforce issues with Senators Chris Murphy and Richard Blumenthal and House members Jim Himes, Joe Courtney and Elizabeth Esty. Besides updating everyone on the activities of the CTC, CVG and the fast growth and needs of TicketNetwork, there was much discussion about IT security,H-1B visa needs, support for Broadband expansion and continued investment in innovation and R&D through tax credits and increased budgets for items such as NSF and NIH. communications Bristol based giant ESPN is the new Chairman of the Connecticut Technology Council (CTC). He was elected at the January CTC board meeting, the group’s President & CEO Matthew Nemerson announced. Joining Pagano on the group’s volunteer leadership team for 2013 to 2014 as CTC Vice Chairs will be CTO of the state’s largest medical device company, Paul Hermes of Covidien, serial entrepreneur Andy Greenawalt, founder of Perimeter eSecurity and currently CEO of Continuity Control and longtime board member Tony Allen, founder and Managing Partner of The Impact Group, a leading corporate strategic consulting firm. Allen has co-led the Council’s periodic planning and direction for ten years since Nemerson joined as CEO in 2003. The Council also re-elected Joe Savage, Executive Vice President, Commercial Banking, Webster Bank and Webster Financial Corporation as the Treasurer, Alan Mendelson, founder of Axiom Venture Partners and a longtime leader in the state’s venture community as Assistant Treasurer and Richard Harris, a partner in Day Pitney, LLPs where he chairs the firm’s technology practice, as the CTC board’s Corporate Secretary. “Chuck Pagano exemplifies the spirit and best that Connecticut has to offer the world: he grew up here, went to school here and has been part of one the greatest business success stories in the world, without losing any of his passion and concern for his home state,” said Chris Kalish, former Executive Director of the GE Edge Lab and CTC’s chairman for the past four years, who is an IT consultant to the TJX Companies. Pagano joined ESPN in 1979 and has been part of every expansion and addition to their giant Bristol campus. He has led the sports networks evolution into one of the leading video production businesses in the world and oversees billions of dollars of facilities and operations. A native of Waterbury, Connecticut, Pagano received a Bachelor of Science degree in electrical engineering and a Master of Science degree in organizational psychology both from the University of Hartford and also studies astronomy in the Graduate Liberal Studies Program at Wesleyan University. “I am excited about the opportunity to give back to my home state and to bring my experience into areas of economic development and public policy. This is going to be fun and rewarding,” Pagano said. Tony Allen is a Managing Partner of The IMPACT Group, a consultancy that works with a diverse clientele of international organizations in the development and deployment of strategy and operational performance improvement. In this role he brings 25 years of global strategic and operational management experience to this collaboration of experienced senior executives from diverse industry backgrounds. IMPACT has conducted more than 100 projects with clients in 20 countries on six continents providing business transformation consulting to a wide variety of clientele from start-ups to Fortune 50 companies. He was educated at the University of Maine and studied Business Management at the Swedish Institute of Management, Darden School of Business at the University of Virginia and the Fuqua School at Duke University. He is also a graduate from the Center for Creative Leadership. “No one has put his imprint on the Council in the way that Tony has – both by helping us plan, by helping us see the opportunities in front of us and by stressing the role of execution and follow through in everything we do,” added Nemerson. Thursday's official launch of a coordinated effort to perfect and manage a state Innovation Ecosystem marks an important step towards increasing levels and success of entrepreneurial activity and new company formation in Connecticut. What's more, by addressing the subtle but critical role of networks and ongoing attention to the needs of the community of high potential firms it represents a sophisticated appreciation by Governor Malloy's economic development team about the need for a comprehensive plan to grow jobs with support for innovation at its center. From Eli Whitney in the 1970s to Jonathan Rothberg today Connecticut has a rich legacy of innovative minds and companies who have built and been part of networks and whole ecosystems that have brought the state not just one company or invention, but billions of dollars of value and whole industries worth of jobs. Throughout our history state businesses have successfully adapted to changing local and global conditions and reinvented their products and their companies thanks to the power of establishing world leadership in broad areas of skills and techniques. The power of networks and connections has been the secret source of our little place in a big global marketplace. The state's new brand, Still Revolutionary, is a not so quiet reminder that, while some places are inventing themselves for the first time, Connecticut, from hardware, to clocks, to carriages, to bikes, to aircraft, to new medications has reinvented itself as a global leader in the nation’s key industries in every half century for the past 250 years. But this strength, a clear competitive advantage for Connecticut, has not been fully capitalized on in any meaningful or strategic way over the past few decades. The post-industrial decline of great industries stripped our key cities and the state of key parts of our rich and deep innovation traditions and connections. The best path to return Connecticut to sustainable growth includes establishing strong networks that align our resources with the digital and information based industries – biotech, finance, insurance, aerospace, media and information systems - that we know can flourish here. This is the goal of the new innovation ecosystem effort. This new model is a blueprint for how a state can partner with many parts of the private, educational and institutional sectors to create a dynamic, entrepreneur-responsive environment where innovators can tap into the resources they need to grow and thrive. Four hubs will be established in Stamford, Storrs, New Haven and Hartford that will assess all local resources and then work on a case by case basis to connect startups and existing firms with the potential to grow with the people, services, funds and attention they need, when they need it. The hubs will also share and compare what they have and what they need with the other hubs. All of this activity – still powered and led by the energy and initiative of Connecticut’s native and attracted entrepreneurs – will be monitored and fine-tuned by the efforts of a team our organization will lead along with the state’s Economic Resource Center. Nothing and no one will fall through the cracks and scarce resources will be applied where they are most needed. Studies that our group conducted in 2010 showed that the lack of strong and helpful networks was one of the most sought after conditions among our most successful high growth CEOs. The ecosystem programs will create a true public-private partnership to benefit and drive innovation. It is a great sign that the Governor and his team have the confidence to allow this to be an organic, learn as you go, bottom-up, innovation community-based effort. The bottom line for the state and its citizens will be over time an increase in Connecticut’s innovation “output” – the number of new startups and the number of mid-size firms that will be able to invest in innovation to stimulate growth. Firms from all industry areas will be impacted. This is not picking winners, but laying out a red carpet for those that have the highest likelihood of rapid growth. This will strengthen the state’s global reputation as a home for innovation. In today’s world the key is to have companies and people who are destined for success to choose to come or stay here. Only one out 50 firms will be a true fast grower. We need to increase the number of these who want to and can grow in Connecticut. Finally, it is good to see that Governor Malloy clearly recognizes that a one-size-fits-all approach to economic development does not work. The First Five/Next Five program focuses on large companies and the Small Business Express program provides financing for the state’s small, established businesses. Now the innovation ecosystem will target our becoming a leader in high growth startups and fast growing smaller firms. Ironically, Connecticut today has what is probably the finest state supported venture capital program in the country, Connecticut Innovations. The ecosystem will deliver a stream of new opportunities that will be worthy of this key state resource to invest in. For those of us in the in tech community, the understanding by the Governor and his team that networks and relationships as well as agile and quick signs of support are the currency of growing a modern economy is very good news. Eli Whitney chose Connecticut to start his business here, as did Oliver Winchester and Igor Sikorsky. They each saw and said that the environment – the ecosystem – was the best for their big plans. Together they created networks and relationship we still feel today. So the networks and connections made now will still be reverberating in Connecticut 200 years into the future. These are the stakes we are playing for today. The CTC’s Matthew Nemerson travelled to China this March with a delegation from Connecticut including Marcum LLP senior partner John Schuyler who is also chairman of the Connecticut – US Commerce Department Export Council, senior staff from CT Innovations, a partner from Wiggin & Dana, LLP and Daniel Drew, the new mayor of Middletown. Unlike most trade missions, the goal was not to sell products per se, but instead to seek direct investments from Chinese government and private entities that are looking to purchase or take positions in American firms with technologies that are of interest to the Chinese. Quite a turn of the screw from 25 years ago when Connecticut first set sail for China with an official trade mission led then by Governor William O’Neal. The hope in 1987 was to land big contracts for manufactured goods to sell or make them – inside in a growing country. Now, with trillions of US dollars on hand in various types of organizations and a growing group of internationally savvy investors, China is a legitimate and huge source of venture capital. Along the way if the companies can find partners to exploit growing Chinese markets that is more upside, but for the forty or so firms – some CI portfolio firms, others clients of Wiggin & Dana or Marcum and seven established CTC members – were all being pitched as if this were the old CVG Crossroads event. Eighty government officials and curious investors showed up in Jinan City, Shandong Province and two days later nearly 100 were on hand in Shenyang, Liaoning Province – a bulging city of 4 million with a software incubator itself larger than a few northeast corner Connecticut towns. CTC firms represented by Matthew included Axxun, Directedvision, i-Mark, Secure RF, Spot On Networks, Tribute Creations and VR Sim. All of the companies seemed to be of some curiosity to business people in the two audiences, but no deals have been completed to date. In addition to the meetings and presentations, the delegation was shown the site of a newly planned 1.7 million person “Bio-Tech City” in Liaoning province. Still under construction, it will be complete in five years time, together with a 180-mph high-speed rail connection to Beijing. They sure seem to do things differently over there! Why does the state of Connecticut have some of the best assets for innovation and technology development in the country of all states, but regularly performs far below the levels of expectation for new firm startups and the growth of jobs in medium sized tech firms, those with 10 to 100 employees? This fundamental question was the subject the of the CTC’s ground-breaking 2010 study The Connecticut Competitive Agenda Project. In 2011, CTC President & CEO Matthew Nemerson and Agenda Project manager Casey Pickett turned the Agenda report into a set of policy suggestions and concepts leading to a road-map for Connecticut to begin turning around the “innovation and entrepreneurship gap” in the state. Pickett was then hired by the Department of Economic and Community Development mid-way through last year to become the state’s Director of Innovation. Ideas from the CTC Agenda helped secure over $125 million in new funding over the next five years for various innovation and job creating concepts at the October 2011 special “Jobs” session of general assembly. About $5 million of the funding has been ear-marked especially for efforts to build a strong network of innovation supporters and connected systems throughout the state to make a strong attempt to compete with Massachusetts and New York City for high potential tech startups and to better assist key medium sized firms already here to grow by investing in innovation and other key strategic assets. The Tech Council has been working closely with the state to play a role in what will be called the Connecticut Innovation Ecosystem. We hope to report on exciting news around this two year effort soon. East Hartford, Conn. – Connecticut Technology Council said future economic growth is very possible as it issued its 2011 public policy agenda today for the consideration of the new Governor Malloy Administration, the State Legislature and other economic development groups . The Agenda is organized around the key parts of what has become known as the “innovation eco-system.” This is the set of conditions and relationships that give a region the ability to create companies and jobs through the complex process of commercializing intellectual property. Parts of this eco-system include university or corporate tech transfer, adequate investment capital, start-up business acceleration, incentives, networks, available talent, global connections and regional infrastructure. Each of these ingredients is addressed in the Agenda. Board members Kevin Burns, CEO of Precision Combustion in North Haven and Frank Marco, a partner in the New Haven founded Wiggin & Dana law firm, were the co-chairs of the task force that oversaw the drafting of the document over several months and involving over half of the groups 45 person board during many meetings and discussions. “We are delighted that Governor Malloy and the legislative leadership have indicated their appreciation of the importance of innovation to creating the jobs of the future economic prosperity for the state, and believe that the public- private initiatives recommended by our Agenda can play a key role in this effort”, said Marco. “Connecticut finds itself in a categories of locations that are going to depend on high value added jobs and very competitive companies, in a league with places such as Silicon Valley, Boston, Austin Texas, and countries such as Denmark, Singapore and South Korea. We are moving full speed into a post industrial future – that doesn’t mean we won’t have manufacturing – but it does mean that R&D and innovation will drive our economic growth. This agenda addresses what we and other locations have learned about what it takes to compete in this league. Ironically we invented this type of economy in the 1840s and excelled for 150 years. We can do this again,” said CTC President and CEO Matthew Nemerson. The technology council will produce a third document later this month outlining a range additional specific projects and concepts in each of the eight areas in which the Agenda has issued broader recommendations. The Agenda is viewable below and available as a downloadable PDF file at www.ct.org. Matthew Nemerson met with representatives of the OSTP to discuss the President’s Startup America and JumpStart America efforts while in Washington DC on February 16 to take part the first ever Innovation Coalition Capitol “fly-in”. The Coalition is made up of various national trade associations including TECNA (the Technology Councils of North America) of which Matthew is currently the volunteer President of the Board of Directors. Other members of the coalition include ACA (Angel capital), SSTI (tech policy), NASVF (seed and venture funds), NBIA (incubators), AURP (Unversity research parks) and AUTM (University technology managers). [link to slide deck]. The meeting with the OSTP was to work out ways the group can work with the Obama Administration to help target funding for the development of regional “innovation eco-systems” around the country and to coordinate future grant programs for innovation from the SBA and EDA. About 150 represenbtives of the coalition including the heads of seven tech councils attended the meeting and heard from Senator Mark Pryor (D-AR); Representative John R. Sarbanes (D-MD), John Fernandez, U.S. Assistant Secretary of Commerce for Economic Development, Phil Singerman, Associate Director (AD) for Innovation and Industry Services, National Institute of Standards and Technology (NIST) and former Yale Law student and Yale Entrepreneurship Institute graduate Doug Rand, Office of Science and Technology Policy (OSTP). Dan Berglund, President and CEO, State Science and Technology Institute (SSTI) and Matthew addressed the larger group as well. 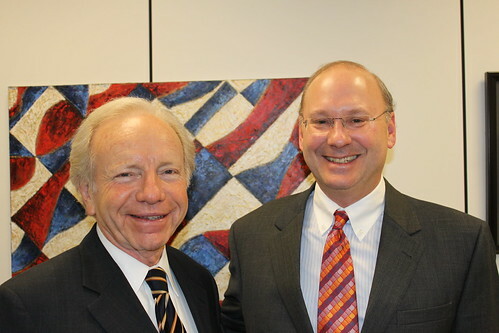 Afterwards Matthew met with the new staff of Connecticut Senator Richard Blumenthal and talked personally with Senator Joe Lieberman. The topics addressed in the morning session included the America Competes Act , national Angel Tax Credit concepts, the importance of innovation for sustainable job creation and worries about decreases in budgets for critical agencies such as NIST, NSF and NIH. Special thanks to CompTIA for that groups sponsorship of the day. I want to thank each of you for your time, commitment and support this past year. In the midst of change, turmoil and challenges, I think we can all say that the community represented by the Tech Council rose to the occasion and tried to make the state a stronger and more competitive location for the 2,000 high tech businesses and some 200,000 employees and participants in our clusters of the state’s economy. We have always had the ability – again with your financial support - to bring the community together through our many programs and awards events. Over the past five years we expanded greatly to try to change for the better the entire innovation eco-system of the state. So, a year a half ago, when we lost the state grant and all funding for our important, successful, but sadly political incorrect (we still don’t know exactly why) program the “Innovation Pipeline Accelerator” we came together – with your input - as an organization, to do some soul searching and to create a refined strategic vision for the organization. Freed from the need to tip toe around the state’s relationships with the tech community (for fear of losing our funding…) and from our own focus on service and not advocacy, we shifted gears to have a louder, truer and more focused voice in time for whatever new administration would come into power this coming January. Through our successful grass roots and policy efforts with last spring’s “Jobs Bill,” the recent announcement of the Competitiveness Agenda and our new Alliance with the CT Venture Group, we have completed step one of repositioning ourselves as the leading advocates for a strong and vocal technology community. Even if you don’t agree with every part of what we are saying , at least we are getting in the habit of being heard. We don’t know what next year will bring, but there is every reason to believe that despite the serious budget issues about to slam us, the new Malloy administration will be a great partner and leader in working to make the state more competitive and to take many of our issues to the next levels. Fast growing tech firms are so intrinsic to the creation of new jobs that it is hard to imagine we will not be working closely with all levels of government just as we will expand our ability to work with the many parts of the technology community. A strong environment for fast growing tech start-ups? The global hunt for high value sustainable jobs will be the top policy goal of our new Governor. How he solves this challenge will ultimately be more important than the onerous task of balancing the state budget. In my capacity as president of TECNA, the trade association for technology councils in the US and Canada, I have been meeting with public policy makers from the Obama Administration to discuss their views of how to create more high-potential tech start-ups. Their efforts to support and coordinate innovation policy are unprecedented since the end of the moon program. Let’s hope they are not derailed by coming budget cutbacks and political changes in DC. We should all work to be certain their efforts spill into places such as Connecticut to make our region stronger and better equipped to grow our key technology clusters. If the White House, EDA, SBA and others agree to really support a series of regional innovation networks – or whatever they are called – it will be a watershed moment for US policy. First, by encouraging dialogue about innovation based growth between parts of the country, and second, by providing grants and contests that might increase funding for programs that will result in more American research being commercialized here, rather than somewhere else in the world. A recent survey of the CEOs of fast growing companies in Connecticut confirms the need to build on key parts of our innovation support environment: human and cluster networks, universities partnerships and target early stage capital. The region’s tech community must be strong advocates for connecting our new Governor with key Connecticut resources such as CI, Yale and UConn, CCAT and our base of global private firms with these new concepts to grow our capacity to be a strong environment for fast growing tech start-ups. In January 2010, following a several month strategic planning process by the CTC’s board of directors, the Council embarked on a detailed set of efforts we call the Connecticut Competitiveness Agenda Project to help give the next state Governor an intimate view of how high potential technology firms see the world and the advice they have for making Connecticut more competitive. While the full results will not be released for several more weeks, the massive data and meetings reviewed to date show that while there are many key challenges facing the tech community – many if not most of the issues can be handled through changes in attitudes, policies and leadership and will not require major new expenditures. The final report should be full of revelations of opportunities that are within reach of the next administration. Realizing that most discussions of economic development focus on preserving the clusters we have or looking to see which new industries seem to hold potential, it was decided that the Council would come to the table with a new thrust, providing the point of view of the leaders of the technology companies in the state which are doing very well. We guessed that issues of taxes, energy, and traffic would not be of top importance to these leaders, but that a new set of concerns and examples of best practices from other places would emerge. Our assumption is that these leaders have a unique sense of what else was out there in this country or the world that might entice their firms to leave or split operations in the future and this would provide excellent benchmarks. So we sought the advice and insights of these successful CEOs and will try to describe what the state might do to keep their firms here as they continue to grow. The end result will be a detailed set of recommendations on how to grow companies and jobs in the state to the two final candidates for Governor, former Stamford Mayor and Democrat Dan Malloy and former Ambassador to Ireland Republican Tom Foley. The result, according to Council Chairman Chris Kalish, Director of GE’s Edgelab, will be, “a truly unique and timely set of insights from the most credible point of view in the economy – successful CEOs of firms who are adding jobs and who have the potential to add more in the years ahead. What these men and women think about Connecticut and the advice they have is invaluable. The Technology Council has a unique window into how and where jobs will be created in the state. Data and studies from around the developed, post-industrial countries show that in any given year the majority of new jobs are created by a small number of fast growing – usually quite small – firms. The combination of working with the final candidates for Governor, cataloguing the insights of key CEOs and reviewing all important reports compiled recently about states and how to become economically more competitive, should help the next administration make the state a stronger location for technology firms. A report will be released by late September.